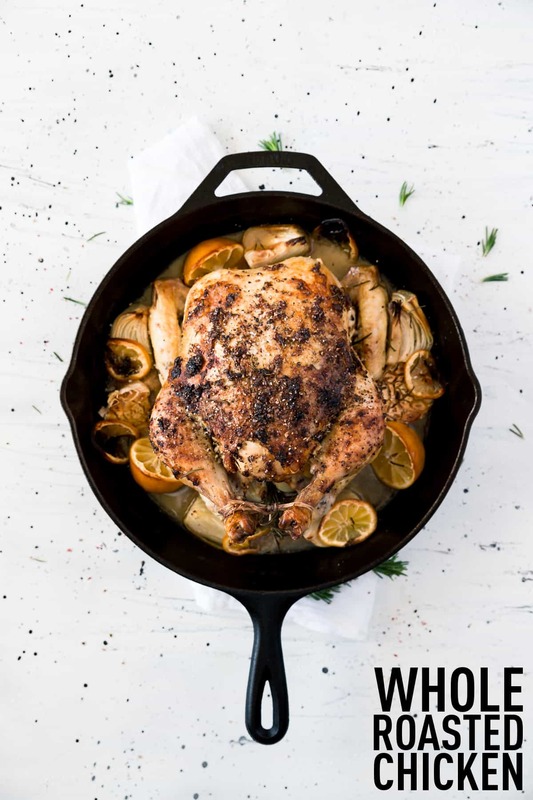 How to cook a whole baked chicken in a few simple steps to yield a moist, flavor-packed chicken that you can serve for dinner any night of the week. Whole cooked chicken is one of my very favorite dishes to make. 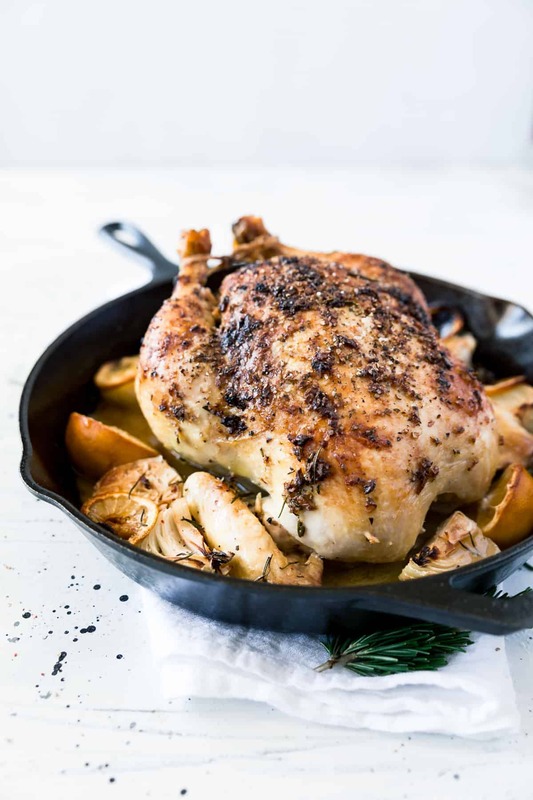 It’s great all year long, because it’s such a classic chicken main dish recipe that pairs well with all kinds of sides. I feel like a whole baked chicken might be a bit intimidating, so I’m here to show you that it’s really very simple. The moist and tender meat that you get is worth making, too. No more dried out chicken breasts for dinner. We raised 36 broiler hens last fall with our neighbors and then the day before Thanksgiving we processed all of the birds. So I have lots of whole chickens in my freezer right now. The time and energy that it takes to humanely and respectfully raise your own meat isn’t lost on me. So I always like to treat the chicken in my freezer as something special. 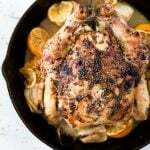 This recipe is a tried-and-true method for cooking a whole chicken that turns out well every time. My family of 7 can eat a whole chicken for a meal. If your family is smaller, you should be able to make two meals out of a 5-pound chicken. If I’m wanting to stretch one chicken to two meals for my family, I’ll remove what meat I want for a later meal (normally a scant 2 cups) and serve the rest. We’ll enjoy the chicken and fill up on the sides when the chicken runs out. And then I save the bones and skins from this recipe and make stock out of them. So one chicken can be made into several meals this way which makes them very cost effective to cook whole. I’ll link to some of the recipes that I like to use my extra chicken for at the bottom of the post. 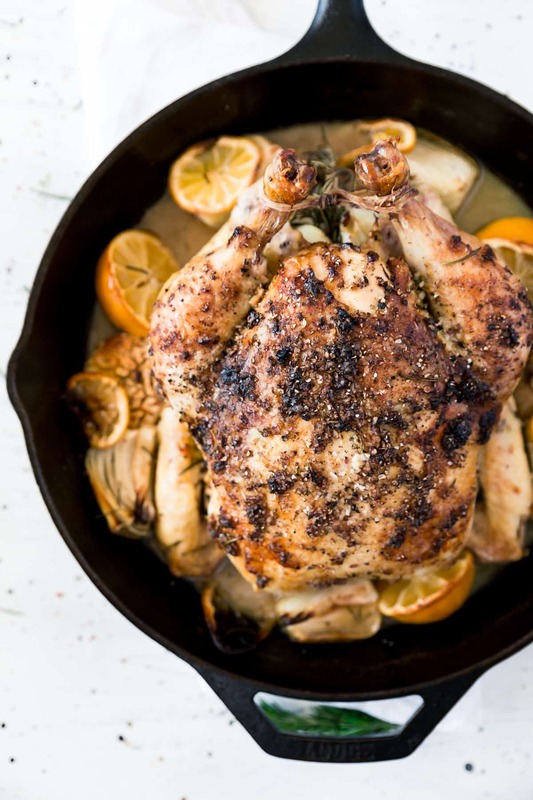 A five-pound chicken is a great size when it comes to roasting a whole chicken in the oven! It’s enough to feed about 6 people for dinner or, if you have a smaller family, it’ll be enough to eat for a meal and then use the shredded chicken in another recipe. Customize this recipe to your liking! I love subbing the rosemary for thyme and sage. No butter or not eating dairy? Use olive oil or coconut oil. The lemon in this recipe doesn’t produce much of a lemon flavor; it just adds moisture and some good “aromatics”. If you’d like more of a lemon chicken, zest your lemons and add the zest to the butter before adding it to the chicken. So good! Cast iron skillets are life. Do you have one yet (I LOVE my 12-inch skillet)? If not, feel free to use 9×13 inch baking pan with sides. This is a great recipe to throw baked potatoes in the oven with! The drippings left in the pan make excellent gravy! The back of your cornstarch box should have a recipe for gravy made with pan drippings. How pretty is that chicken? 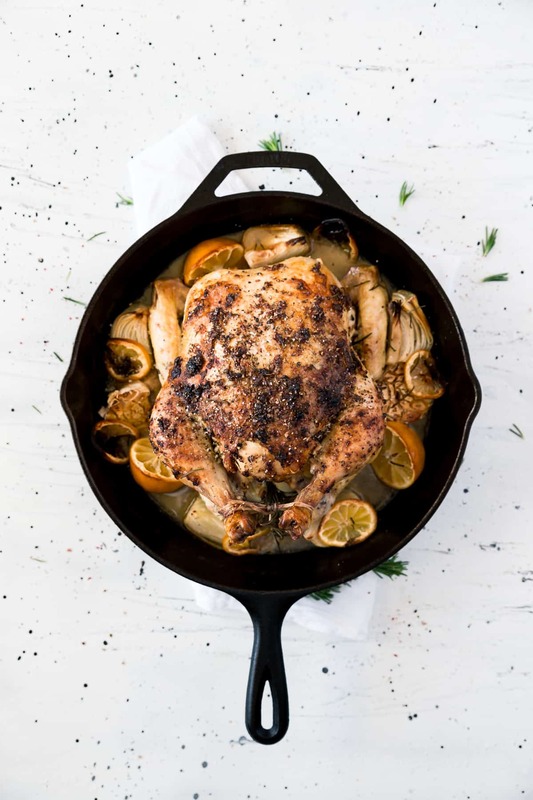 What I love is that you can serve it whole right out of the pan or break down the chicken into pieces before it hits the table. It looks great either way! Preheat the oven to 425 degrees and position a rack in the lower third of the oven. Mix the butter with minced rosemary, 3 cloves of minced garlic, lemon zest, salt, and pepper. Adjust seasoning as needed. 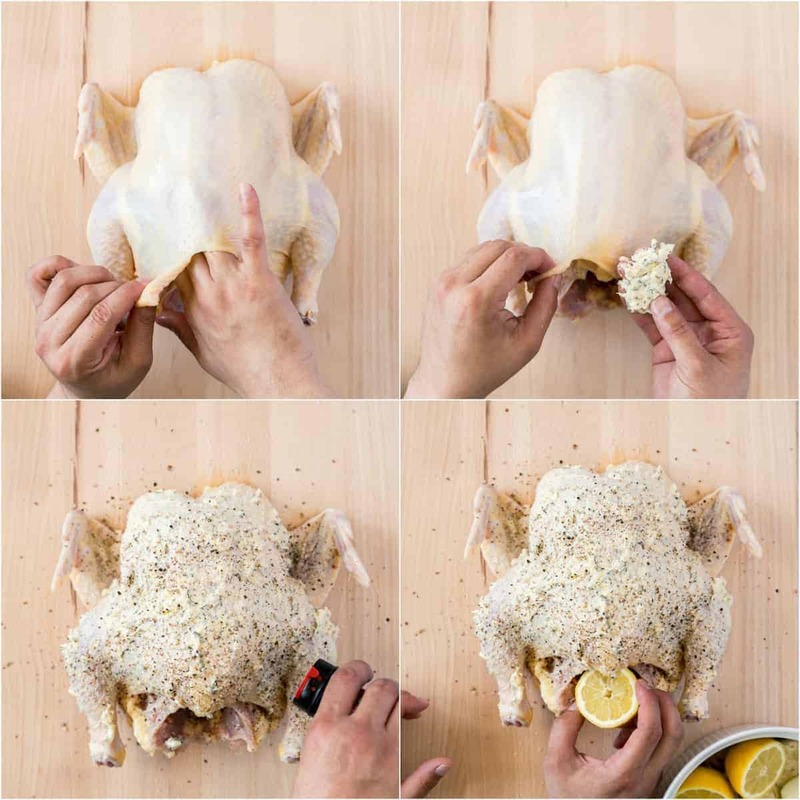 Pat the chicken dry, then gently pull up the skin and rub half of the butter mixture underneath the skin. Rub the remaining half of the butter mixture over the chicken, then sprinkle with salt and pepper. Generously season the cavity of the chicken with salt and pepper then stuff with 2 lemon halves, 1/2 head of garlic, 2-3 quarters of onion and 2 rosemary sprigs. Tie legs with cooking twine and tuck the wings under bird. 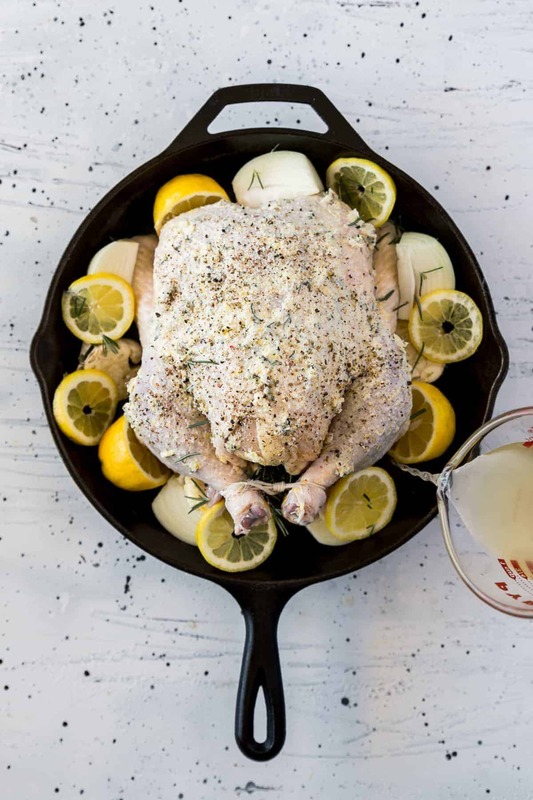 Place chicken in a roasting pan or high-sided large skillet breast-side-up with the remaining onion, garlic, lemons, and herbs, then add the chicken broth. Roast for 45 minutes or until the breast is firm and the chicken is turning golden brown. If the chicken is turning too dark, gently cover with a loose piece of foil and roast for about 20 minutes longer, until an instant-read thermometer inserted in the inner thigh registers 165 degrees and juices are running clear. There you have it. 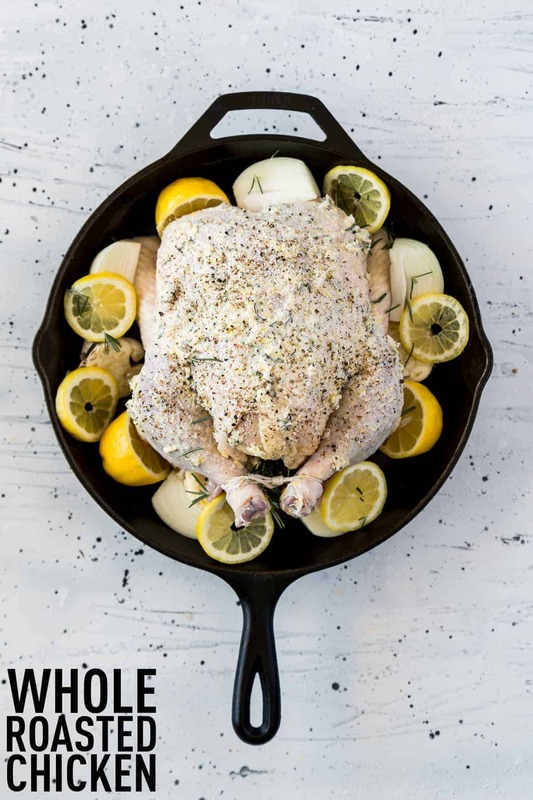 A great recipe and tutorial on how to make a whole baked chicken! I hope it’s one that you come back to again and again. Enjoy from my kitchen to yours.